GETTING THERE FROM HERE-One of the problems facing those who long for better transportation options, such as a new freeway, rail line, sidewalk or bicycle path is that so many things compete for prioritization. Ditto for infrastructure associated with water, power, sewage, energy, the Internet or cable. And as someone who's longed for a Westside-Valley (or Valley-Westside) transit project, I suggest you consider the following: it's not going to happen anytime soon. Which is a pity, and certainly not a suggestion that this project, which would link the San Fernando Valley to the Westside (and vice versa) and offer commuters traveling across the Sepulveda Pass another option to the mega-congested I-405 freeway, is a low-priority project or one that isn't important. It's just that there are so many other big projects already prioritizing rail construction resources--the Expo Line, the Foothill Gold Line, the Downtown Light Rail Connector, the Crenshaw/LAX Line and the Wilshire Subway make up 5 projects that will create long east-west and north-south projects that will link the entire county to Downtown and LAX. So where does the Westside-Valley (or Sepulveda Pass) Transit Project exist in the grand scheme of things? A victim of geography and lack of consensus, unfortunately--and a BIG price-tag, to boot, as the growing awareness that this project will likely exist as another subway permeates its way through the hopes and dreams of planners everywhere. Just as the idea of light rail to the various regions of the county (such as the South Bay) have to take a back seat to connecting MetroRail to LAX, the Wilshire Subway, which just broke ground, will have to reach the 405 freeway before it can be connected north to the Valley with a Sepulveda Pass Line. And when would that happen? 2025? 2030? 2035? Hard to say--the costs and legal issues surrounding the Purple Line aren't going away, despite the desire of many to build the Wilshire Subway (also known a the Metro Purple Line). Furthermore, the price tag of converting the Orange Line Busway ($2 billion or more) to a light rail line, and bring the San Fernando Valley up the same transit standards as the rest of the county, pales before the cost of this Sepulveda Pass project, which could easily be $4-6 billion or more...so the SF Valley will probably first create an Orange Light Rail Line. Not hard to conclude that--despite the Measure R-funded $1 billion for the Sepulveda Pass project--the goal of establishing both ends of the future Westside-Valley rail project (the Orange and Purple Lines, perhaps the Orange and Expo Lines) has to come first. Yet other unanswered questions abound--would this be a rail project only, or a combined "Big Dig" to create an underground freeway toll project to enhance freeway capacity while also creating a light rail line? 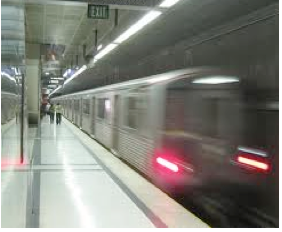 Would a heavy-rail project to be compatible with the Wilshire Subway be chosen? Would a light-rail project to be compatible with the Green, Crenshaw and Expo Lines be chosen? Regardless of how these questions are answered, until a Major Investment Study is commenced we won't be able to know what will be built. That $1 billion from Measure R could simply create a fleet of buses and some bus/rail interface stations to utilize the new carpool/HOV lanes that just opened...and that's all we'll see for now. Which--to repeat my opening sentiments--doesn't mean that this project is unimportant. It's just a victim of geography, priority, costs and lack of consensus. But it's not a project that's going away. Not long ago, the Expo and Wilshire rail lines were science fiction, and look where they're at now. So...try to focus on what we can do, and what we are doing, and try to remember that the big battles for traffic relief and improvement do NOT involve what rail lines or freeway projects we're building. They involve the tendency to overplan and overbuild our commercial and residential developments. Because no matter what we build, unsustainable overdevelopment will trump every new transportation project--no matter how beneficial, and no matter what helpful effects are associated with it--every time. le Lines, perhaps the Orange and Expo Lines) has to come first.